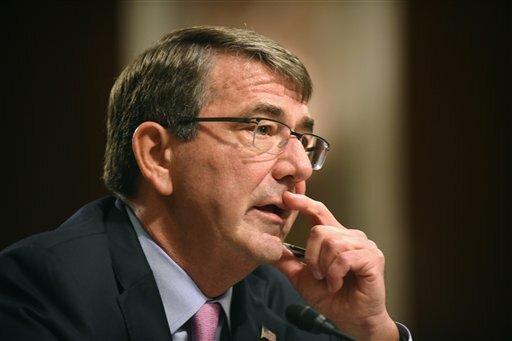 Defense Secretary Ash Carter testifies on Capitol Hill in Washington, Tuesday, Oct. 27, 2015, before the Senate Armed Services Committee. Carter said Tuesday that the U.S. is willing to step up unilateral attacks against Islamic State militants in Iraq or Syria, a signal that the U.S. would escalate American involvement beyond airstrikes by giving the go-ahead for U.S. special operations forces' raids on the ground. Giving new detail to an operation that has been hinted at in recent days, the White House says President Obama has authorized the deployment of a small number of U.S. Special Operations Forces troops — fewer than 50 — to help fight ISIS in Syria. The U.S. personnel will be sent to northern Syria, "where they will help coordinate local ground forces and Coalition efforts" to fight ISIS," a senior administration official confirms to NPR&apos;s Scott Horsley. There is no timeline for the withdrawal of the U.S. special operators from Syria. "This is not a short-term proposition," White House Press Secretary Josh Earnest said at a midday briefing. He later added, "I would not describe it as permanent." When asked about President Obama&apos;s 2013 statement on Syria – in which he said "I will not put American boots on the ground in Syria" – Earnest says the earlier remarks were focused on President Bashar al-Assad and his regime&apos;s killing of civilians, rather than the threat of ISIS. "Our strategy all along," Earnest says, has been to train and supply forces within Syria to help them fight. He later said of the U.S. personnel being sent to Syria, "They will not be in a combat mission." He said the current move is being undertaken because forces in Syria have shown success when they work directly with U.S. personnel on an "advise-and-assist" basis. "The president does expect that they can have an impact," White House Press Secretary Josh Earnest said when asked about the possible effect of fewer than 50 people. Earnest later reiterated that the U.S. believes the long-term solution to problems in Syria and to the threat of ISIS must also involve political, not just military, means. Earnest began the briefing by saying President Obama spoke with Iraq&apos;s Prime Minister Haider Abadi; the two discussed Iraq&apos;s efforts to retake Ramadi as well as the broader counter-ISIS strategy, Earnest said. Press Secretary Josh Earnest delivered a news briefing that was scheduled to start at 12:30; you can watch the video stream above. The U.S. personnel will travel from Irbil, Iraq, where they&apos;re currently stationed, to work with the Syrian Arab Coalition, a group that has its sights set on Raqqa, the ISIS stronghold, a U.S. official tells NPR&apos;s Tom Bowman. While the group is likely too small to take Raqqa, it&apos;s seen as being capable of pressuring ISIS there. In addition to the Special Forces group, Obama is ordering A-10 and F-15 jets to deploy to Turkey&apos;s Incirlik airbase. U.S. officials will also work with Iraq to establish a Special Operations Force task force, as well as help Jordan and Lebanon counter ISIS. Saying that the U.S. is "intensifying elements of our strategy that have been working, while also moving away from elements of our approach that have proven less effective," the senior administration official said the U.S. effort to fight ISIS has shown "good progress in both Iraq and Syria when we have worked closely with effective partners on the ground who have proven capable of reclaiming territory from ISIL and going on offense." When they arrive, the U.S. personnel will enter a region that&apos;s contested by a wide range of combatants, from extremist Islamic State fighters to government forces and rebel militias in Syria. Russia&apos;s military is conducting airstrikes there — and just days ago, Turkey attacked a U.S.-allied Kurdish militia group in Syria. In one month of operations, Russia says it has carried out airstrikes on more than 1,600 targets. According to the state Tass news agency, Russia&apos;s "air group in Syria includes more than 50 warplanes, including Su-34 and Su-24M bombers; Su-25 assault aircraft; Su-30SM fighter jets as well as Mi-8 and Mi-24 helicopters." 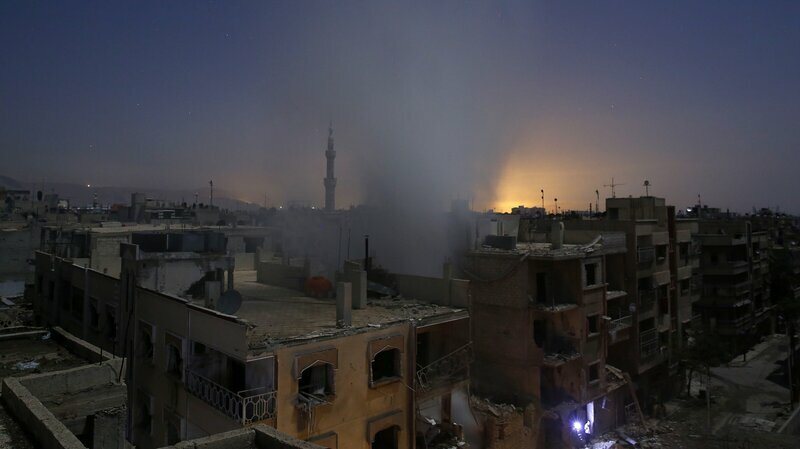 The violence in Syria has devastated cities, towns and historic sites. It&apos;s also blamed for thousands of civilian deaths — and for sparking a refugee crisis, as people flee their homes for safety in Europe and elsewhere. The new details about the U.S. plan come days after Defense Secretary Ashton Carter told Congress that the U.S. will step up its efforts to directly target the group that calls itself the Islamic State. "We won&apos;t hold back from supporting capable partners in opportunistic attacks against ISIL, or conducting such missions directly whether by strikes from the air or direct action on the ground," Carter told the Senate Armed Services Committee. At that session, Carter "used the term &apos;direct action on the ground&apos; to refer to operations like the hostage rescue mission that left one American soldier dead," as Eyder wrote for the Two-Way on Tuesday. News of the special forces deployment also comes as the U.S. and more than 10 other nations are discussing the future of Syria and its president, Bashar Assad, at an international meeting in Vienna on Friday.